I find myself the owner of a sunny little Tiny House, which I’ve called the Rad Pad. 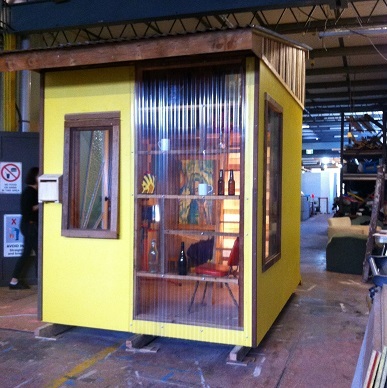 It came about because earlier this year late March, I organised Sydney’s first Tiny House Building Course. – I’m proud to say. There was such a diverse mix of people attending; young couples, middle aged professionals, students and married couples. People came from all around Sydney, Canberra, Melbourne and one brave Kiwi flew in from Singapore. I can’t speak for everyone, but it’s true we have a few things in common; we value having more life, than we do using a lot of that life to get stuff. We pretty much knew nothing about using a hammer or a saw, let alone able to build a house from scratch. Lastly, we pretty much had a blast, it was exhilarating to know we can in fact build our own homes. Part of our course was filmed by the TV station SBS Living Tiny check it out, unlike a lot of media commentary of late, they did a fair job of tapping into what’s happening here in OZ with the Tiny House Movement. It would not of been as successful as it was, if I hadn’t brought over the talented, creative and well known Tiny House Builders ‘Deek’ Diedricksen and his brother Dustin (of Relaxshacks.com) all the way from Massachusetts, USA to lead the course. Here is little tutorial he recorded from our course . Do subscribe to his channel – it’s the bomb. I also got the invaluable assistance from Rob Scott a Melbourne House Truck builder and Trainer and a local community college (TAFE) building instructor Anthony kept everything to Aussie standards. The whole project for me was a real challenge and to be honest; stressful to get everything and everyone organised, particularly as I had no knowledge at all of how to put a building course together. There were a few times, my ignorance could of landed us in serious trouble with the Sydney Council and the training centre. But hey, the Universe is kind to fools, (seriously there were a couple of lucky coincidences and meeting extraordinary helpful people that meant we came through unscarred). Thank you Universe. The journey is not over though. I want to make some kind of dent in the housing situation for women refuges, kids at risk and the homeless. I’m travelling to Canada and USA this year to look at Tiny House Communities on the other side of the planet. I also donated the Rad Pad to a lovely lady called Fatima as the first of five Tiny Homes we are going to build providing temporary accommodation for women refuges when they come to her beautiful grassy property in Goulburn. Moving forward, we’ll continue to run the training courses, because we one provide training to people wanting to build their own homes, two cover the cost of a new Tiny House’s materials and three in effect have ‘free’ labour building a new Tiny for the Refuge Retreat. Therefore far less money is required to pay for additional expenses; off grid solar power, electrician etc. If any have done this sort of thing before, I would certainly like to get in touch, network with you for support and ideas. My email is Catherine@peepsweave.com. As per usual, I am working all this out as I go along. Wish me luck.